1. This Ruling relates to an issue that has arisen in the course of the Tribunal’s inquiries, pursuant to paragraph (e) of its Terms of Reference, into the circumstances surrounding the grant of the second GSM mobile telecommunications licence to ESAT Digifone on 16th May, 1996. The particular issue which has arisen relates to an opinion of Counsel dated 9th May, 1996 that was provided to the Department of Transport, Energy & Communications (as it then was) in the weeks leading up to the grant of the licence. In brief, IIU Limited and Mr Dermot Desmond have sought access to the opinion over which the Department and the Attorney General have maintained, and continue to maintain, a claim to legal professional privilege. What IIU and Mr Desmond are effectively asserting (and in which regard they are supported by Mr Denis O’Brien) is that the Tribunal should make an Order for Production of the opinion, pursuant to the powers conferred on it by the Tribunals of Inquiry (Evidence) Acts, 1921 and 1979, notwithstanding that claim to privilege. 2. In order to put this matter in context, it is necessary in the first place to make reference to both the circumstances in which the opinion was sought by the Department, and to the Tribunal’s dealings with the Department in relation to it. 3. The second GSM process which led to the licensing of ESAT Digifone comprised two distinct phases. The first phase, which involved the competitive evaluation of tenders submitted by interested parties, commenced on 4th August, 1995 with the receipt of tenders, and concluded on 25th October, 1995 with the announcement that ESAT Digifone was the winner of that competitive process. What ESAT Digifone won, was not the right to the second GSM licence, but rather the exclusive entitlement to negotiate with the Department for the grant of the licence. The second phase of the process involved negotiations between ESAT Digifone and the Department which ultimately led to the grant of the licence. This second phase commenced very shortly after the announcement of 25th October, 1995, and concluded on 16th May, 1996, when the licence was issued. “The question of whether recent correspondence suggests any change in the identity of the beneficial owners of the company which could be considered incompatible with the ownership proposals in the company’s application must be addressed”. 5. Whilst the correspondence received from Messrs William Fry, and the dealings between the Department and the office of the Attorney General featured in evidence led by the Tribunal in the course of public sittings, the opinion of 9th May was not led in evidence by the Tribunal having regard to the legal professional privilege attaching to it, which was accepted by the Tribunal and indeed is accepted by IIU Limited and Mr Desmond, and is further accepted in principle by Mr O’Brien. 6. With regard to this second preliminary matter, it is necessary to refer briefly to the Tribunal’s dealings with the Department in relation to the production of documentation. From in or about May, 2001, the Tribunal was in contact with the Chief State Solicitor’s Office with a view to obtaining copies of all documents held by both the Department and the Department of Finance, in relation to the entire second GSM process. At all times, it has been the preference of the Tribunal, in furthering its inquires, to obtain documents from parties on a voluntary rather than a compulsory footing, and its dealings with both Departments were at all times on that basis. The documents in question were produced to the Tribunal voluntarily, and in the course of that exercise the Chief State Solicitor’s Office furnished the Tribunal on 15th February, 2002, with a schedule of documents itemising documents that had been withheld by the Department, pending consideration of a claim to legal professional privilege. By letter dated 18th February, 2002, the Tribunal responded by indicating that as a lengthy period had already passed since documents had been provided by the Department, the Tribunal wished to receive confirmation from the Department within seven days as to whether it was, or was not maintaining a claim to privilege over the documents listed in the Schedule, and if so, wished to obtain details of the basis on which such claim was being maintained in respect of each document or category of documents withheld. 7. From the inception of its private inquiries, the Tribunal adopted a procedure for dealing in a pragmatic and efficient manner with claims to legal professional privilege made by persons from whom the Tribunal was seeking the production of documentation. Rather than ruling on such claims to privilege, which could involve a costly and time-consuming process in relation to documentation which might not ultimately be of any assistance to its inquiries, or material to its Terms of Reference, the Tribunal developed a practice of requesting persons maintaining such a claim to provide copies of such documents to the Tribunal for the purposes of examination only without prejudice to such claim. This practice obviated the necessity of the Tribunal having to rule on privilege if it transpired, as was very often the case, that the documents were not material to the Tribunal’s Terms of Reference or not significant in terms of the Tribunal’s inquiries. In the event that the Tribunal determined that such documentation was significant, it was agreed that the claim to privilege could be fully ventilated, and would then be ruled on by the Tribunal. It was this course that was adopted in the case of the documentation listed in the Schedule with which the Tribunal was furnished by the Department, and which included the opinion of 9th May, 1996. 8. Notwithstanding that IIU/Mr Desmond accept that the opinion is privileged, they have sought access to it as they understandably wish to ascertain for themselves whether the advice sought had actually been obtained. The Tribunal has considerable sympathy with the position of IIU Limited/Mr Desmond, and in the first instance, endeavoured to facilitate them by seeking to put in place some arrangement whereby they might have access to the Opinion, but those efforts came to nothing. In that regard, the Tribunal sought to ascertain whether the Department would be agreeable to waiving privilege, but by letter dated 6th December, 2005, the Chief State Solicitor’s Office informed the Tribunal that, having considered the matter, the Department was not prepared to waive privilege in respect of the Opinion. 9. The Tribunal then instituted a procedure whereby it invited IIU/Mr Desmond and the Department to furnish the Tribunal with written submissions addressed to the issue. Written submissions were received on behalf of IIU/Mr Desmond on 2nd March, 2006 and from the Department on 12th June, 2006. Copies of the submissions of each of the parties were in turn served on the other, and each of them was invited to furnish supplemental submissions if they chose so to do, but neither availed of that option. All other affected persons, including the Public Interest, were also extended the facility of making submissions, and submissions were received on behalf of Mr Denis O’Brien on 18th January, 2008. Copies of those submissions were in turn provided to both IIU Limited/Mr Desmond, the Department and the Public Interest, who were again invited to make supplemental submissions. Supplemental submissions were received from the Department on the 1st of February, 2008, and initial submissions, limited to a single matter raised by Mr O’Brien, were also received from the Attorney General, on behalf of the Public Interest, on 1st February, 2008. Mr O’Brien, having been served with the public interest submissions, provided final submission on 20th February, 2008. The Tribunal has fully considered all of the submissions which it has received. (i) That there has been an implied waiver of the privilege by reason of references made to the opinion in the course of the Tribunal’s sittings. (ii) That, irrespective of the privilege attaching to the opinion, it should be disclosed pursuant to the principles recognised by the Supreme Court in the case of O’Callaghan v. Mahon. Mr O’Brien also accepts that the opinion is prima facie privileged but has submitted that, in circumstances to which reference will be made, there is no reality attaching to the claim of privilege, and/or the privilege has been waived. A further submission is made that other legal considerations justify the Tribunal in overriding the Government’s privilege, and directing full disclosure of the opinion. The Tribunal will consider each of these matters in turn. 11. The thrust of the submissions of IIU and Mr Desmond is that references were made in the course of the evidence of departmental witnesses to the opinion, and that passages of the opinion were put to Mr Loughrey in the course of cross-examination by Mr Eoin McGonigal SC, Counsel for Mr O’Brien, without objection by the Department. It is contended that these references were made for “litigious advantage”, and that accordingly there has been an implied waiver of privilege. The Department has submitted, in brief, that the request made by IIU/Mr Desmond is based on a fundamental misconception of what occurred in the course of the Tribunal’s inquiries, and that there has been no implied waiver of privilege, either by virtue of any partial disclosure or otherwise and that further, such disclosure as may have occurred was not for the purpose of “litigious advantage”. 12. Before proceeding to consider the legal principles applicable, it is appropriate to set out briefly what occurred in the course of the Tribunal’s public sittings. As already adverted to, the Department’s request for the provision of an opinion by the Office of the Attorney General was prompted by the notification received from Messrs William Fry on 17th April, 1996, that a 25% shareholding in ESAT Digifone would be allocated to IIU Limited, rather than to the institutions to which reference was made in the tender submitted by ESAT Digifone, and evaluated by the Department. This matter formed one aspect of a much broader inquiry made by the Tribunal as to the actions of the Department, and of the then Minister, in the weeks preceding the issue of the licence on 16th May, 1996. In particular, the Tribunal was pursuing inquiries into what action (if any) was taken by the Department and the Minister on foot of that communication from Messrs William Fry, what decision was made on foot of that communication, and what factors may have prompted or contributed to that decision. 13. Whilst the opinion of 9th May, 1996, was not opened in the course of evidence, IIU/Mr Desmond have instanced references to the opinion in the course of the evidence of Mr Martin Brennan (who was Chairman of the Project Group established to evaluate the bids), Mr Fintan Towey, who was a member of the Project Group and who had signed the letter of 24th April, 1996, to the Office of the Attorney General requesting the provision of an opinion, and the evidence of Mr John Loughrey, who was then Secretary General. 14. Before proceeding to consider the authorities to which the Tribunal has been referred, it is necessary to explain that Messrs William Fry were in possession of a copy of the opinion due to an inadvertent error on the part of the Tribunal. Prior to circulating public sittings books to affected persons on 22nd November, 2002, for the purposes of its sittings which commenced on 3rd December, 2002, the Tribunal, at the request of Messrs William Fry, furnished Mr O’Brien with advance copies of documentation relating to the second GSM process in order to assist him in the preparation of a voluntary statement; the Tribunal having been informed that he would otherwise be disadvantaged in making such a statement. The Tribunal in that letter made it clear that it had not yet determined what documentation, from within the documents furnished, would be ventilated at public sittings. 15. It appears that due to an error on the part of the Tribunal, a copy of the opinion of 9th May was inadvertently included. A copy was not within the public sittings books circulated to all affected persons, including Mr O’Brien, on 22nd November for the purposes of ventilation at public sittings. The error did not come to the attention of the Tribunal until extracts of the opinion were referred to in the course of cross-examination. 16. The Tribunal has helpfully been referred to the relevant authorities on the waiver of legal professional privilege, and in particular the decisions of the Supreme Court in Hannigan v. Director of Public Prosecutionsand Fyffes plc v. DCC plc. The former case involved Judicial Review proceedings in which the applicant (who had been charged with a criminal offence) made certain claims regarding the conduct of the Director. In the course of the proceedings, the applicant sought discovery of a letter from the Director giving directions as to what charge or charges should be proceeded with, and in what form. The Supreme Court recognised that the letter over which privilege had been claimed was relevant, and the issue turned on whether there had been an implied waiver. It was held that there had been an implied waiver of the privilege arising from references not just to the letter, but to a summary of its contents, in the replying Affidavit which had been sworn on behalf of the Director. The Supreme Court was of the view that the disclosure was for the purpose of rebutting the applicant’s contention that the charges against him could have been dealt with summarily but that the Director withdrew his consent when it became clear that the applicant did not intend to plead guilty to the offences with which he was charged. “The general rule is that where privileged material is deployed in Court in an interlocutory application, privilege in that and any associated material is waived”. “The opposite party…must have the opportunity of satisfying themselves that what the party has chosen to release from privilege represents the whole of the material relevant to the issue in question”. “I would conclude, however, that the well-established rule regarding privilege, whether including a notion of fairness or not, goes no further than the proposition that a party who seeks to deploy his privileged documents by partially disclosing them or summarising their effect so as to gain an advantage over his opponent in the action in which they are privileged, runs a serious risk of losing the privilege. I do not deny that the partial disclosure which has that effect might, in some circumstances, be made to a third party, but it would have to be for the purpose of gaining an advantage in that action”. 18. IIU/ Mr Desmond have submitted that the references to the opinion by Mr Brennan, Mr Towey and Mr Loughrey in their evidence to the Tribunal, together with the opening of passages from the opinion by Counsel for Mr Denis O’Brien, in the course of Mr Loughrey’s cross-examination, without objection by Counsel for the Department, constituted a “deployment” of the opinion by the Department, and that this was done for “litigious advantage”. In that regard, it is contended by IIU/Mr Desmond that the Department witnesses made reference to the opinion to demonstrate that the issue of change of ownership was duly considered by them, and that they had been reassured by the contents of that opinion. It is asserted that that is sufficient to satisfy the “litigious advantage” test. 19. The Department has submitted that the references in the course of evidence related to the seeking and the coming into existence of the opinion, and that the issue which arose in the course of Mr Loughrey’s cross-examination was whether it was appropriate for Mr Loughrey to express an opinion on a matter which had already been the subject of Counsel’s opinion. It is asserted that neither of these matters constitutes a partial waiver of privilege. It is further submitted that it was Mr O’Brien’s Counsel who was permitted to read passages from the opinion, and that it is not possible for a third party to waive privilege. Without prejudice to those arguments, it is further contended that if some inaccurate or partial disclosure did take place, it did not occur for “litigious advantage”. In that regard, the Department points out that the Tribunal is an investigative body, and that accordingly there is no lis, there is no litigation, and it follows that there can be no “litigation advantage” within the meaning of the test adopted in the Hannigan case. 20. The Tribunal has considered the submissions and the relevant authorities. It is clear that what must be determined by the Tribunal is whether the references in the course of the evidence of the departmental witnesses in response to questioning by the Tribunal, together with the non-objection by the Department to passages of the opinion being opened by Counsel for Mr O’Brien in the course of Mr Loughrey’s cross-examination, constituted a “deployment” of the opinion by the Department, and if so, whether that was for the purpose of “litigious advantage”. (i) References to Opinion in course of evidence in chief. 21. It has always been recognised, and is undoubtedly the position that legal professional privilege belongs to the party to whom the legal advice has been furnished, which in this instance is the Department. The privilege therefore could not be waived by references to the opinion made by the Tribunal, or Tribunal Counsel, or it seems by departmental witnesses, who could not be presumed to be authorised, expressly or impliedly, to waive privilege on behalf of the Department. The references to the opinion in the course of Mr Brennan’s evidence on 4th February, 2003, Mr Towey’s evidence on 20th May, 2003 and Mr Loughrey’s evidence on 21st February, 2003 fall far short of the partial disclosure of the contents of the opinion. In the course of the evidence given by the departmental witnesses on those dates, there was no reference whatsoever to the contents of the opinion in question. 22. The sole reference to the contents of the opinion was made by Counsel for the Tribunal when questioning Mr Brennan on 4th February, 2003 when he commented “…it doesn’t seem that the opinion that was eventually obtained or pursued dealt with that issue; it seemed to deal mainly with Section 8…” (It should be observed in passing that the reference to Section 8 related to an entirely different matter whereby the Department could place restrictions on the future alienation of shares in ESAT Digifone following the issue of the licence). It seems to the Tribunal that there was nothing in the exchanges between Tribunal Counsel and the departmental witnesses that could approximate to a “deployment” of the opinion by the Department. (ii) Non-objection by Counsel for the Department to the putting of passages from the opinion to Mr Loughrey by Counsel for Mr O’Brien. 23. The opening of passages of the opinion by Mr O’Brien’s Counsel in the course of Mr Loughrey’s cross-examination on 27th February, 2003, patently constituted some form of disclosure of the contents of the opinion. The disclosure in this instance was not of course made by the Department, but by Counsel for Mr O’Brien, albeit without objection by Counsel for the Department. The issue therefore is whether what occurred was tantamount to a “deployment” of a portion of the opinion by the Department. In the absence of evidence or any suggestion to the contrary, there can be no question but that Counsel instructed to represent the Department in the Tribunal proceedings, as distinct from departmental witnesses, must be deemed to have been authorised to bind the Department in this regard. That being the case, the matter turns on whether the actions of Mr O’Brien’s Counsel, without objection by the Department, should be treated as those of the Department. 24. No suggestion has been made by IIU/Mr Desmond, nor does it appear to the Tribunal that there is any evidence that the Department was complicit in the course taken by Mr O’Brien’s Counsel. Nor was it a result of any act or omission on the part of the Department that Mr O’Brien’s representatives were in possession of a copy of the Opinion, so that there can be no question of any waiver through disclosure to a third party as was considered in the Fyffes plc v. DCC plc case. 25. Counsel for the Department did not object to what transpired, and what must be addressed is whether the Department’s passivity in the face of the evident intention of Mr O’Brien’s Counsel to disclose a portion of the opinion is sufficient to satisfy the test of “deployment” as contemplated by the Supreme Court. It seems to the Tribunal that in order to constitute a “deployment” within the terms contemplated by the Hannigan case, that which is required is some conscious and deliberate use of selected portions of the privileged document by the party in whom the privilege is vested, as in the Hannigan case, where the replying affidavit filed in the judicial review proceedings was expressly stated to be sworn on behalf of the Director, and which not only referred to the privileged advices but summarised their contents. Such an affidavit, as in the case of a pleading, would have been carefully constructed, and it must be taken that references to the advices and their contents were deliberately included in the affidavit. In contrast, it seems to the Tribunal that there was nothing deliberate or conscious in the Department’s acquiescence in the disclosure made by Mr O’Brien’s Counsel. Neither the Department nor its Counsel referred to the opinion, quoted from passages of it, had any input into the selection of the passages quoted, nor it seems to the Tribunal had any role in initiating the events that gave rise to the disclosure. In these circumstances, it is the Tribunal’s view that the Department’s mere acquiescence in what occurred lacks the requisite deliberation or involvement to constitute a “deployment” by the Department in the terms contemplated by the Supreme Court in the Hannigan case. “Sorry, in fairness in to Mr Loughrey, my Lord, Mr Chairman, I am not in the least bit trying to infiltrate in relation to Mr Nesbitt’s opinion or question it in any way. The document speaks for itself. But what I am suggesting is, that there are aspects of the document which open lines of inquiry for the Tribunal, more so than Mr Loughrey, but they give a flavour, insofar as Mr Nesbitt was briefed, as to the concerns which were happening in the Department at that time, and insofar as that is relevant as a line of inquiry, it seems to me that it should be brought to the Tribunal’s attention in public session. It is for no other reason than that”. It is apparent from what was stated in this regard that Mr McGonigal was not seeking to draw the attention of the Tribunal, or the witness, to the advices comprised in the Opinion, but rather to the matters on which Counsel had been briefed, as indicative of the concerns of the Department. 27. Having already ruled that there was no deployment of the opinion by the Department, it is not strictly speaking necessary for the Tribunal to consider whether such disclosure as occurred was for the purpose of “litigious advantage”. However, as it has been contended that the concept is applicable to the proceedings of a tribunal of inquiry, it seems of sufficient importance to warrant comment. 28. It is trite law to state that neither the Tribunal itself, nor those assisting it with its inquiries, nor those to whom representation is granted are engaged in litigation. This principle was recognised in Goodman International v. Hamilton (No. 1) and has been confirmed in numerous subsequent cases. The Tribunal is an investigative body engaged in a purely inquisitorial function. There is accordingly no lis, there are no proceedings, and there are no parties, in the sense of plaintiffs or defendants, but merely parties assisting the Tribunal with it inquiries. 29. In these circumstances, the concept of “litigious advantage” has no direct application to Tribunal proceedings, nor is it a concept that can easily be superimposed on the work of a tribunal. IIU/Mr Desmond have asserted that an advantage equivalent to “litigious advantage” accrued to the Department consequent on the disclosure by Counsel for Mr O’Brien. It is asserted that the references to the opinion were made for the purpose of demonstrating that the issue of change of ownership was duly considered by them, and that they had been reassured by the contents of that opinion. 30. Even if such a purpose was served by the partial disclosure, in order for that purpose to constitute something akin to “litigious advantage”, it could only be operative, if there was a corresponding disadvantage suffered by IIU/Mr Desmond. There is nothing in the circumstances surrounding the Tribunal’s inquiries which could give rise to any such disadvantage on the part of IIU/Mr Desmond. This, it seems to the Tribunal, arises from the absence of any issue on this point which could potentially impact adversely on IIU/Mr Desmond. There is no suggestion that the involvement of IIU/Mr Desmond was not fully known to the Department at that time, nor is there any suggestion that IIU/Mr Desmond had any role in the requesting or furnishing of an opinion on the point. This was solely a matter for the Department, and ultimately it is only material to the Tribunal’s inquiries in terms of the involvement (if any) of the then Minister, Mr Michael Lowry. 31. IIU/Mr Desmond are also seeking access to the Opinion on the basis of the principles enunciated by the Supreme Court in the case of O’Callaghan v. Mahon. They contend that the opinion has been examined by the Tribunal in the course of its private investigations, and as it may impinge on what are characterised as allegations made against them, the fundamental fairness recognised in the O’Callaghan decision dictates that the opinion should be made available to them. The Department has also provided the Tribunal with submissions addressed to this matter. The Department asserts that the O’Callaghan case has no application to privileged, as opposed to confidential documents. The Department also points to the absence of any concrete explanation by IIU/Mr Desmond as to what relevance the opinion might have, and how the absence of access to it might adversely affect their position or, with specific reference to the O’Callaghan decision, any respect in which their cross-examination of departmental witnesses has been limited or undermined by not having access to the Opinion. 32. It is the view of the Tribunal that the principles of the O’Callaghan case have no application to privileged documents, as opposed to those documents which the Tribunal has treated as confidential. It is important in this regard to bear in mind that in the O’Callaghan case the Applicant sought access to previous statements made by a witness, who in evidence made serious allegations against the Applicant, which were not comprised in the witness statement circulated prior to that witness being called to give evidence. The previous statements which had been furnished to the Tribunal, in the course of its private investigative work, were required by the Applicant in order to enable the Applicant to cross-examine the witness who had made the allegations for the purpose of vindicating the Applicant’s reputation. The document in question was not privileged, and there is nothing in that judgment which, in the view of the Tribunal, could extend to documents over which a valid claim to privilege subsists. 33. It has been suggested by IIU/Mr Desmond, in the course of submissions, that an allegation has been made by the Tribunal that they evaded the competition evaluation conducted by the Department, and that in some unenumerated fashion access to the opinion of 9th May might assist them in meeting that allegation. In the first instance, the Tribunal wishes to correct any misconception on the part of IIU/Mr Desmond or any other person. No such allegation has ever been made by the Tribunal, or by any witness to the Tribunal, nor has such an inquiry been pursued. Rather, what has been inquired into is whether IIU/Mr Desmond went through the evaluation process. The Tribunal’s inquiries, insofar as they have focused on the composition of the ESAT Digifone consortium, which was subject to competitive evaluation, have not been directed to the conduct of IIU/Mr Desmond, but to the conduct of the Department after the involvement of IIU/Mr Desmond emerged, and whether that conduct was influenced, in any respect, by any actions or omissions on the part of the then Minister, Mr Michael Lowry. 34. In the above connection, it has also been submitted by the Department, with some force, that the issue which falls for determination by the Tribunal is not what was contained in the opinion, but what those who received the opinion believed that it contained. The Department has observed that the departmental officials have given evidence regarding what they believed at the time, and that the substantive issue to be addressed by the Tribunal revolves around the credibility of those witnesses. Their credibility has been fully tested both in examination by the Tribunal and in cross-examination, including cross-examination by Counsel on behalf of Mr O’Brien who had access to the entire opinion. 35. In conclusion, it is the Tribunal’s view that the O’Callaghan decision has no application to privileged documents, and that there are no principles of fundamental fairness recognised in that decision which would warrant a dilution of the Department’s right to exclude from disclosure the privileged communication which it received. 36. 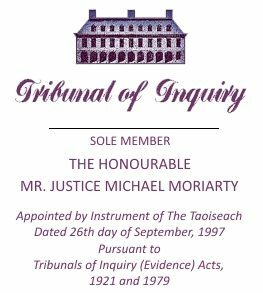 It has been submitted on behalf of Mr O’Brien, that the purpose for which the opinion of 9th May, 1996 was sought is distinguishable from the investigations of the Tribunal, and the consequences of those investigations, and that having regard to the Tribunal’s obligation to discover the facts surrounding the issue of the second GSM licence, the balance between the Tribunal’s obligations, and the privilege attaching to the opinion, shifts in favour of disclosure. In this regard, reliance is placed on a decision of the English Court of Appeal of Parry-Jones v. Law Society. In response to that aspect of Mr O’Brien’s submissions, the Tribunal has received submissions from the Attorney General on behalf of the Public Interest which are confined to this single issue. The public interest submissions contend that the authority relied upon by Mr O’Brien has no application to a tribunal, such as this Tribunal, established under the provisions of the Tribunal’s of Inquiry (Evidence) Act, 1921, and further that it is clear from the provisions of that Act, and has been authoritatively recognised in this jurisdiction, that the powers conferred on the Tribunal to direct the production of documents are circumscribed by legal professional privilege irrespective of the purpose for which the document may have been generated. 37. Mr O’Brien’s submission rests on the presumption that the purpose for which the opinion was sought was the protection of the Department in the event of a subsequent Court challenge to the Department’s actions in awarding the licence to ESAT Digifone leading to an Order invalidating the licence. It is contended that this purpose is distinguishable and independent of the functions of the Tribunal, which are to inquire pursuant to its Terms of Reference, and to make findings of fact which cannot impact on the validity of the licence. It is further submitted by Mr O’Brien that such distinction is comparable to that considered by the English Court of Appeal in the Parry-Jones case in which a solicitor, under investigation by the English Law Society, in its regulatory capacity, unsuccessfully claimed legal professional privilege in respect of documentation over which his client would have been entitled to claim privilege. Lord Denning MR held that the Law Society’s statutory powers of investigation overrode any privilege or confidence that might otherwise have subsisted between Solicitor and client. What is contended by Mr O’Brien is that the inquiry being conducted by the Tribunal is analogous to that which was being conducted by the Law Society in that case. “…the usual rules of legal professional privilege apply, see Section 46(6) of the Act”. 44. The Public Interest distinguishes that statutory regime from the Tribunals of Inquiry (Evidence) Acts, 1921-2004, being the statutory regime under which the Tribunal operates. In particular, it is asserted, and the Tribunal believes correctly, that by reason of Section 1(3) and Section 1(4) of the 1921 Act, it is clear that persons before a Tribunal of Inquiry are entitled to invoke legal professional privilege on the same basis as parties to proceedings before the High Court. “A witness before any such Tribunal shall be entitled to the same immunities and privileges as if he were a witness before the High Court or Court of Session”. 39. It is the Tribunal’s view that it follows from the provisions of both Section 1(3) and Section 1(4) of the 1921 Act, that a person who produces documents to a Tribunal either under compulsion of an Order of the Tribunal, or voluntarily, does so on the same footing, and with the self same immunities and privileges as a party disclosing documentation in the course of High Court proceedings. 40. Whilst the Tribunal has been referred to authorities, including a decision of the Privy Council in the New Zealand case of B. v. Auckland District Law Society (PC) and of the Court of Appeal in Three Rivers District Council v. Governor and Company of the Bank of England (NO 6). , neither of those authorities address the specific statutory scheme under consideration, and in particular S.1 (4) of the 1921 Act. “…where it is established that a communication was made between a person and his lawyer acting for him as a lawyer for the purposes of obtaining from such lawyer legal advice, whether at the initiation of the client or the lawyer, that communication made on such an occasion should in general be privileged or exempt from disclosure, except with the consent of the client” at p.478. “Legal professional privilege is more than a mere rule of evidence. It is a fundamental condition on which the administration of justice as a whole rests”. “Legal professional privilege is also protected by the European Convention on Human Rights. In Niemitez v. Germany (1992) 16 EHRR 97, the European Court of Human Rights took the view that a warrant which permitted the search of a lawyer’s officer was ‘not necessary in a democratic society’. The power, which took no account of any special protection which might be desirable in relation to the lawyer’s premises was disproportionate to its purposes. The Court took the view that where a lawyer was involved ‘..An encroachment on professional secrecy may have repercussions on the proper administration of justice and hence on the rights guaranteed by Article 6 of the Convention’”. 44. Similarly, the invocation of legal professional privilege on the self same terms as applicable in Court proceedings, was also recognised, and upheld in a further decision of Kelly J. in Irish Haemophilia Society v. Lindsey. “Either because the nature of things for which the warrant authorised a search to be undertaken made it unlikely they would be found in a lawyer’s office, or because in virtually every English statute in which compulsory information gathering powers have been given to regulatory bodies that operate extra-judicially. Parliament had (with very few exceptions) expressly provided (in what are referred to in this work as ‘privilege preservation provisions’) that such statutory powers do not include the right to seek privileged materials or documents or statements that evidence them”. Section 1(3) of the 1921 Act is specifically referred to, in a footnote to the text, as containing privilege preservation provisions, and the Tribunal accepts the submission on behalf of the Public Interest that Passmore accordingly recognises that the Parry-Jones decision has no application to a Tribunal of Inquiry having regard to the provisions of Section 1 of the 1921 Act. 46. Finally, it has been submitted on behalf of the Public Interest that the reasoning of the Court of Appeal in the Parry-Jones case has recently been doubted by the English House of Lords in the recent case of R.(Morgan Grenville and Company Limited) v. Special Commissioners, and that this has followed the recognition by the English Courts that privilege is more than a rule of evidence, but has a substantive content, as already recognised by the Courts in this jurisdiction as in Miley v. Flood and Duncan v. Governor of Portlaoise Prison. It is accordingly submitted that even if the Parry-Jones was applicable to the facts under consideration by the Tribunal, it is doubtful that it correctly reflects the law in this jurisdiction. 47. Having regard to all of the foregoing consideration, the Tribunal is satisfied that it is clear, by virtue of Section 1 of the Tribunals of Inquiry (Evidence) Act, 1921, that a party appearing before a tribunal is entitled to the self same privileges (including legal professional privilege) as a party to litigation before the High Court. Section 1(3) and Section 1(4), both individually and collectively, constitute “privilege preservation provisions” as described by Passmore. The Tribunal is bound by the decision of the Supreme Court in the Smurfit Paribas Case, so that the purpose for which the privileged communication was made is immaterial to the rights of the person invoking the privilege, provided there is a validly subsisting claim to privilege. It is further clear to the Tribunal that the Parry-Jones case, irrespective of its status in Irish law, has no application to a tribunal of inquiry established under the 1921 Act. 48. In summary, it is the Ruling of the Tribunal that as there has been no waiver of privilege by the Department over the Opinion of 9th May, 1996, that as the decision in the case of O’Callaghan v. Mahon is not applicable to privileged documents, and that as the purpose for which the opinion was sought has no bearing on the Department’s right to claim privilege before the Tribunal, that access to the Opinion must be denied. Passmore Privilege, Second Edition, 2006 at page 13.